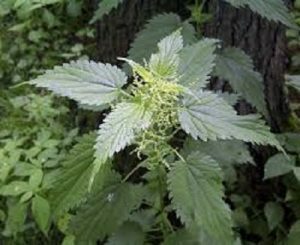 The venom in stinging nettles was initially attributed to formic acid – the same chemical contained in ant venom. Formic acid, histamine, mucilage, minerals (including iron and calcium), vitamins, ammonia, carbonic acid, chlorophyll and water, beta-sitosterol, trans-ferulic acid, dotriacotane, erucic acid, ursolic acid, scopoletin, rutin, quercetin, polysaccharides and p-hydroxylbenzalcohol. The main chemicals are histamine, leukotriene, acetylcholine and 5-hydroxytryptamine (serotonin).